I was talking to John Le Boeuf-Little about Transneptune’s upcoming cybernoir game Piece of Work (which btw is pretty cool, you should keep an eye out). He was talking about flavor testing, and wanting to make sure that the game rules created a certain type of story. Specifically he wanted to make sure that if you tried to play Shadowrun (cyberpunk) with the Piece of Work mechanics the story generated would swerve towards cybernoir. Good question. I realized that the shape of the game is wrong. The points of game interaction are different. What do I mean? Shadowrun, is a D&D type of game. Piece of Work is not. So what is the difference? Tactical combat? Probability? Breadth/Depth/Targetting of mechanics? None of these in my opinion. I think that on some level these are superficial similarities/differences. It’s about what buttons we need to push to play ‘well’ in the scope and purpose of the game. Roleplaying is a social exercise. We all want to do cool things or play well during game. But each game comes with its own challenges and frequently a different set of skills to master. Whether it’s hitting a good joke to trigger your milestone as the Pilot in lady blackbird, framing a hillarious and painful comeuppance scene in Fiasco, or puzzling out the mystery in GUMSHOE – there are complex social and mechanical elements interacting in most of these games (whether they’re dice related or no). And all of us want to have a good time, contribute, and secretly hope to pull off that ‘really cool thing’ that gets the bon mots before and after game. Consequently, when I ask someone what they’re playing in a d20 campaign they might answer “a chain-trip fighter” and I will nod sagely, knowing roughly the shape of their build. Why do they answer like so? I go back to my earlier assumption: Everyone wants to make clever plays. If you watch, say for example, a fighting game tourney, there are times when people gasp and start clapping 30 seconds before the match goes into endgame. Why? They have read the play. Same thing in chess, when you notice a mistake that doesn’t actually come out in piece loss untill 14 moves later. This capacity to read a situation and turn it to our advantage is the play that makes us Ender Wiggin and not just a warm body at a table. Games put the point in which you can do this in different places. Shadowrun is not the same as Piece of Work because Shadowrun and D&D both put the point of clever play long before you actually initiate an encounter (I’ll explain this in a second). Piece of Work really drives at problems framing scenes, and the interaction of motivations driving player actions in the moment. What do I mean by Point of Play? Take a look at a turn in a traditional dungeon crawl game. You name your action(s), pick up dice, roll them, GM narrates the outcome. The player’s point of play is when he actually has the ability to impact the story. Once the dice are picked up they, and the GM have control (and even less than control, since it’s mostly narrative flavor interpreting the roll). These are the points of the game in which you can improve your skill at it, and actually differentiate yourself from others. C stands for creation and pre-game or pre-scene prep games. 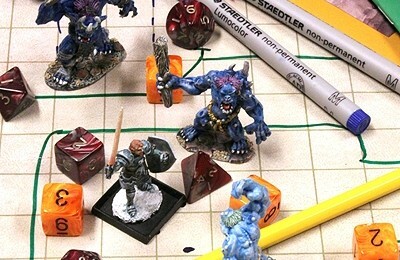 Games that put many of the choices that affect gameplay before the game begins such as Pathfinder or D&D. S games are scene framing games where the setup and narration of the scene, and the establishment of stakes is more important to the impact of the player on the story, and wouldn’t affect the specifics of the mechanics. A good example of an S-type game is Misspent Youth. I games focus on the immediacy of the action, often providing strong ties to fictional positioning, and mechanical bonuses for narration of the action. A good example is Warhammer 3rd or DIY D&D. A games (although few off the top of my head) focus on narrating outcomes within a predetermined set of frameworks. Some after-the-roll play like this can come from guiding a scene to the correctly picked outcome in Fiasco. I also want to stress that most games have multiple ‘types’ within their rule-sets and play procedures (for example I prefer S+I games personally) and that each of these types comes with it’s own sets of pro’s and cons. I’ll see if I can break this down a bit more in the next post.